Sakai commanded 23 Army at Canton when war broke out. He was ordered to capture Hong Kong with 38 Division, which was nominally reassigned to Southern Expeditionary Army, and given a 10-day time limit. Although the deadline was extended, Sakai was frustrated by his failure to make the original deadline, and this may have been reflected in the brutality with which the campaign and occupation were carried out. For example, on 17 December 1941 Sakai delivered an ultimatum to the Allied defenders "that bombing and shelling, which up to that time had been confined to military objectives, would become indiscriminate if the terms were refused" (Official History of the Canadian Army 1946). The conduct of the campaign was also marked by massacres of hospital staff and of surrendered troops. 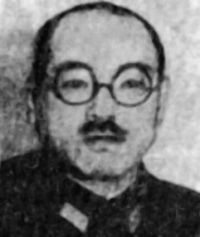 Sakai was executed as a war criminal at Nanking for the atrocities that took place during the Hong Kong campaign, as well as for conspiring to assassinate public figures in China in 1934 and for other atrocities that took place in the Canton area and on Hainan.